This season I've been drooling over Prada and Miu Miu fall collections, with a special mention for the fantasy printed coats and suits. Well, this graphic printed coat is a much cheaper alternative that I was happy to welcome into my wardrobe !. It has three quarter sleeves and an oversize shape, and I thought it would be perfect with a casual outfit made with jeans and a fun sweater !. Questa stagione mi ha vista sbavare sulle collezioni autunnali di Prada e Miu Miu, con menzione speciale per i cappotti e completi a fantasia. Questo cappotto a stampa grafica è un'alternativa sicuramente più economica che sono stata ben felice di accogliere nel mio guardaroba !. Ha le maniche a tre quarti ed una forma oversize, che ho pensato adatta ad un look casual con jeans e un maglione stampato !. I have decided to wear this coat with my Loriblu ankle boots, they have high heels and a delicate python print. I also added a lovely bag that caught my attention a while ago: it's part in demin and it features the skyline of a city and I think it's very cute ! It makes me think of New York. Surely I am also influenced by my love for New York that you must have noticed in my flat !. Only after my purchase I found out, about this bag, that Stussy has teamed up with Love+Made (an all-female creative collective) for a limited-edition collection called "Heartbeat City" that has an 80s vibe. I have this habit of looking up for the things I bought on the internet, do you have it as well ?. Ho deciso di indossare questo cappotto con stivaletti di Loriblu dal tacco alto e dalla delicata stampa pitonata. Ho aggiunto una borsetta deliziosa che ha catturato la mia attenzione tempo fa: è in parte di jeans e raffigura la skyline di una città che mi piace pensare come New York, non è carinissima ?. Sicuramente sono molto di parte a causa della mia ossessione per New York che avete potuto notare anche nel mio appartamento !. Solo dopo il mio acquisto ho scoperto, a proposito della borsa, che Stussy ha collaborato con un collettivo di creative tutto al femminile per una edizione limitata chiamata "Heartbeat City" dal sapore anni '80. Ho questa abitudine di cercare le cose che ho comprato su internet, lo fate anche voi ?. The sweater I am wearing underneath was one of my purchases at Asos, it's very warm and comfy ! It's from River Island and it has "girl" written on it as well as roses design across the chest. I surely I am gonna wear it also with skirts !. Il maglione che indosso sotto al cappotto è stato un acquisto da Asos, è molto caldo e comodo ! E' di River Island e ha la scritta "girl" oltre ad un motivo a rose. Lo indosserò sicuramente anche con le gonne !. 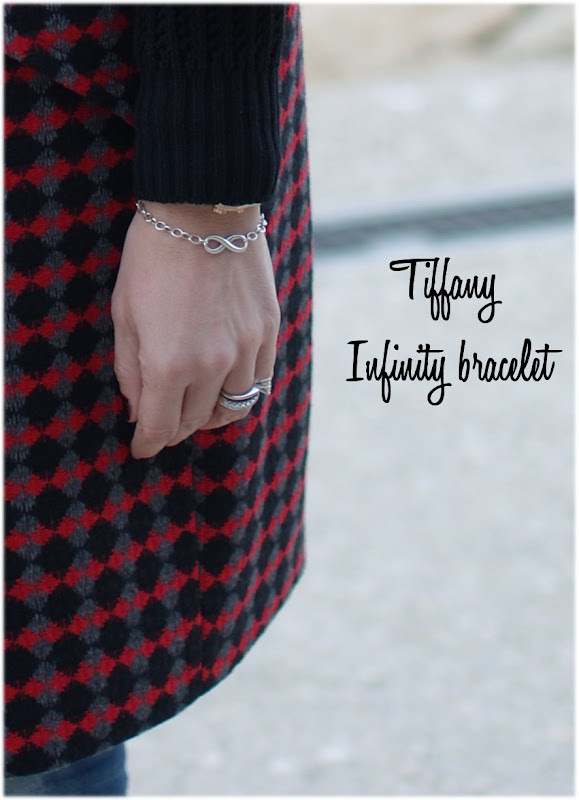 In the pic above, here's my Tiffany Infinity bracelet that it's one of my most treasured Tiffany items. I love it and I think if I didn't have it already, it would surely be in my Christmas wishlist ! Well, wait...there is also an Infinity necklace, after all ! ;). In these pics I am wearing a limited edition lipstick from Estée Lauder, it's violet crush from the Violet Underground collection. This collection is one of my fave make up collections ever ! I got the palette and also both the limited edition lipsticks, they are both very bold and have a matte finish. Now I am off, trying to buy some Christmas presents...as always, I am gonna need to go shopping until the very last day !. Nella foto sopra, ecco il mio bracciale Infinity di Tiffany, uno dei miei gioielli Tiffany più amati e indossati. Credo che se non lo avessi già sarebbe nella mia wishlist natalizia ! Beh, aspettate...c'è anche una collana simile, dopotutto ! ;). In queste foto porto il rossetto in edizione limitata di Estée Lauder, si chiama violet crush dalla collezione Violet Underground, una delle mie preferite di sempre ! Ho sia la palette di ombretti che entrambi i rossetti in edizione limitata, entrambi molto forti e con un finish mat. Ora vado a cercare di comprare qualche regalo di Natale...come sempre, avrò bisogno di fare shopping fino all'ultimo giorno !. So pretty! I love the coat and your shoes! Bellissimo questo cappotto a stampa grafica! sei stupenda! Tutto bellissimo .. ma la borsa é una chicca meravigliosa .. Absolutely fantastic bag and coat! Cheaper but still very pretty. Good coat. You look stunning! Gorgeous snapshots!! !Thanks for sharing such a nice post! Buon shopping allora, il cappotto oversize mi piace molto e ti sta benissimo!! Thanks for your comment and follow! I'm following you too now (GFC, FB, bloglovin). What a wonderful look! I love that coat. Siccome stasera sono arrivata prima ti ho pure messo il cuoricino su bloglovin hehehe! Ma quel cappotto è di imperial? Io è un pezzo che non ci vado perchè l'unico negozio è un po' lontano da me, bellissimi ma proprio da sbavo gli stivaletti loriblu! Tu ami NY, io adoro LA. Non vedo l'ora di tornarci perchè mi manca da matti! E dopo questo sproloquio buonanotte! Thank you for stopping by! And sure I would like to follow each other, love your blog, I am your new follower on GFC, Bloglovin and FB! You look so cozy chic and I ADORE those boots!! Gorgeous, Vale! Oh... bellissimo il cappotto, cara! Love your jacket! That pattern is gorgeous and a classic. You have great style, so glad I came across your blog. Please stop by mine when you get a chance. Follow me and I'd love to follow back! Bellissimo il cappotto!! !Splendida come sempre!! The coat is amazing. Beautiful pattern ! am following you now sweetie , wanna follow back ? il coat asos l'ho visto è devo dirti che mi piace molto,ottima scelta!!! Ciao! Grazie per essere passata da me! Ho dato un'occhiata veloce al tuo blog e mi piace molto...mi sono iscritta! I follow you know and hope you follow back! You look so pretty.Love your coat very much.Getting FREE Christmas Gifts Here,http://www.japan-lingzhi-2daydiet.com/Christmas.html. Hi darling! Great coat! Love your bracelet! Im so sorry for beeing out for that long. Lots of work, and also planning the hollidays. How´s life going?? Thank you so much for the lovely coments on the blog!! You look very stylish as always!! belissimo borso!! also the coat is the so beautiful! Il cappottino è davvero simpatico e diverso dai soliti! I love your coat and shoes ! WOW ! Amazing shoes ! I'm following you n now too. Check out myblog and perhaps follow back ? I love the pretty print on your coat, such great colors! The water background for your pictures is so peaceful! You look great, happy Friday to you! I like the alternative with that coat, but my favorite item on you has to be those awesome shoes!